Europe is still facing an increase in terrorist plotting. This has led to growing security concerns over the fallout of the Syrian conflict, and the sizeable contingents of battle-hardened European foreign fighters, who are seeking to return home. 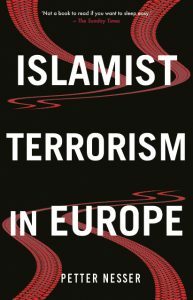 This book provides a comprehensive account of the rise of jihadist militancy in Europe and offers a detailed background for understanding the current and future threat. Based on a wide range of new primary sources, it traces the phenomenon back to the late 1980s, and the formation of jihadist support networks in Europe in the early 1990s. Combining analytical rigour with empirical richness, Petter Nesser offers a comprehensive account of patterns of terrorist cell formation and plots between 1995 and 2017. In contrast to existing research which has emphasised social explanations, failed immigration and homegrown radicalism, this book highlights the transnational aspects. It shows how jihadi terrorism in Europe is intrinsically linked to and reflects the ideological agendas of armed organisations in conflict zones, and how entrepreneurial jihad-veterans facilitate such trans-nationalisation of militancy.